Millie joined us on Sunday November 1st., a day so unseasonably warm and sunny, we stopped with Mr Porter for lunch in a pub garden en route to Camborne to collect our new eight week old black Labrador puppy. It’s fifteen years since we last had a puppy; Wellie was born in the spring of 2000, the year we struggled to restore the farmyard after the big flood of Christmas 1999. Daughter of our doughty sheep dog Meg, she was one of a litter of nine collie cross lurcher pups. A dear dog, she had a long, happy and eventful life until spring 2014. 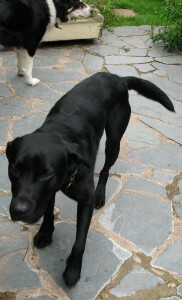 In 2008 Mr Porter joined us, a skinny, frail eighteen-month old black lab with sticking out ribs and under developed muscles in his hind quarters. 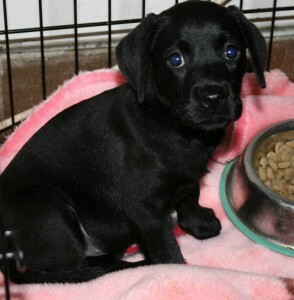 He was rescued by the charity Labrador Rescue Trust from a terrible home where he had been given no exercise and had been kept in a crate without food or water. 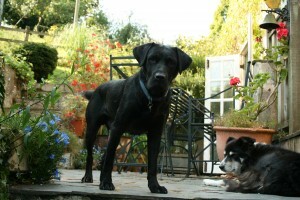 Slowly with love, food and gentle exercise he has grown into a big, loving, funny, boisterous fellow. 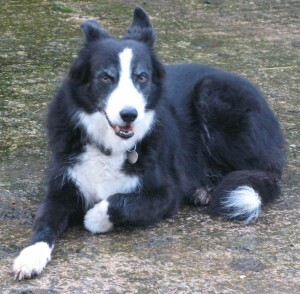 Next came Sam, also a rescue dog. This time we were not so successful. Sam had been so cruelly treated he was not going to learn to trust us or anyone else nor was he to settle happily with Mr P whom he bullied relentlessly. Despite a professional dog training course in Cumbria he continued to chase our sheep. He frightened our grandchildren and finally, he turned on me. Devastated we had to return him to Lab Rescue. The charity reassured us that we were not at fault and that, sadly, sometimes the early cruelty is so unimaginably bad and the damage therefore so deep seated that it cannot be overcome by any amount of love and patience. Poor dog. 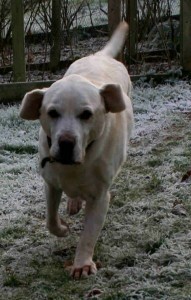 Next came the beloved Barney, a funny yellow Labrador, also a rescue dog belonging to a dear friend of ours. He joined us when our friend became too ill to keep him. Mr Porter adored Barney and they were like two old companions running through the fields together then curling up in front of the fire. 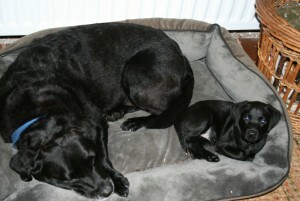 We had Barney for ten wonderful months until severe ill health got the better of him. He was eleven years old. So once again Mr P was alone and, without wishing to anthropomorphise, he was without doubt, a very sad lonely dog. He needed a companion and so did we. 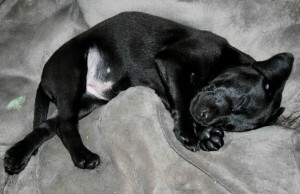 So this time a new Labrador puppy it would be! Labrador Retrievers are the descendants of St John’s Water Dogs used in the C19th by the fisherman of Newfoundland. Impressed by their agility in the water, the second Earl of Malmesbury brought the breed to England in 1830. It was as well he did because by the 1880’s the breed was nearly extinct due to a swingeing government tax on dog ownership resulting in many dogs being destroyed. However, thanks to the Earl, the breed flourished this side of the Atlantic. In order to avoid confusion with the huge indigenous Newfoundland dogs, they soon became known as Labrador Retrievers after the sea they had worked off the shores of Newfoundland. These steady, gentle, intelligent, loving dogs have become one of most popular breeds in this country, recognised by the Kennel Club as early as 1916. 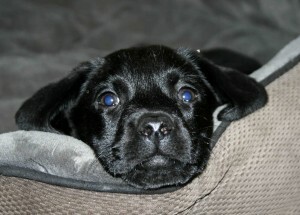 They can be trained to help in so many ways; as guide dogs, assistance dogs, sniffer dogs and, of course, gun dogs. Their waterproof coats, webbed feet and rudder-like tails make them great swimmers and they can cover the ground very fast indeed reaching 12mph in 3 seconds! 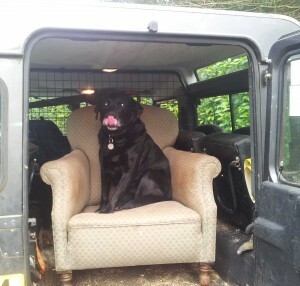 Labrador owners don’t need the gym! They have such soft mouths they can carry eggs without breaking them and retrieve birds without damage. 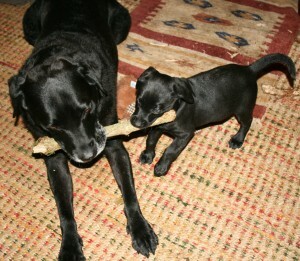 A new puppy is so different to taking on a rescue dog. Millie knows no right or wrong. She is not naughty, she simply doesn’t know what is good or not so good, safe or unsafe. It is entirely up to us and Mr Porter to show her how life is. We play our part and he plays his quite fascinatingly well. He is her hero. 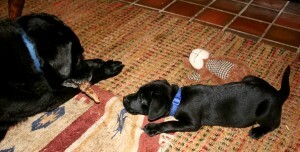 She watches his every move and copies him, for better or worse, regardless. Sometimes it is very funny indeed. He has cheered up no end and plays with her for hours until he’s has had enough when he growls instruction to be left alone. “No variables have more far-reaching effects on personality development than a child’s experiences within the family. Starting during his first months in his relation to both parents, he builds up working models of how attachment figures are likely to behave towards him in any of a variety of situations, and on all those models are based all his expectations, and therefore all his plans, for the rest of his life.” Bowlby (1973). 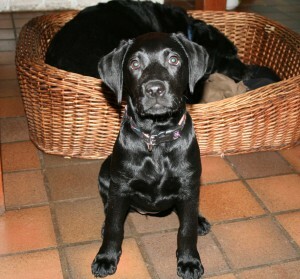 So as we go to our family in Bath this Christmas Mr P will introduce Millie to his beloved “cousins”, a crazy, adorable Cocker spaniel and, yes, another rescue Labrador, a sweet gentle girl saved from a dreadful puppy farm by the R.S.P.C.A. and given a wonderful loving home by our daughter and her family. Millie’s socialisation will continue as she learns to play with other dogs, meet the children and doubtless try to chew the presents! We look forward to a happy, boisterous few days of huge family fun!